My wife and I stumbled on a product by Desert Gardens when we were visiting relatives in Arizona. For years, it was my favorite cornbread – moist, slightly-sweet with a fair amount of zip. We would buy six to ten packages (at $6.50 each) and squirrel them away for future use. Unfortunately our local distributor here in Wisconsin stopped carrying it. Out of frustration….OK, desperation, I reverse-engineered the recipe and tweaked it until I thought it was spot-on to the original product. Chilis vary in heat, so you’ll want to ensure they are palatable for your taste before combining them in this recipe. Enjoy! Preheat your oven to 375-degrees F. Grease a ten-inch cast-iron skillet with vegetable oil or Crisco shortening. Preheat the skillet in the oven while you prepare the batter and the chili pepper. Wash the poblano or NM green chili pepper and char the tough outer skin until blistered, using a portable propane torch. You’ll need to be careful, ensuring that you have a flameproof bowl or secondary skillet so you don’t burn your kitchen countertop. When completely charred, place the chili pepper in a sealed brown paper lunch bag for about ten minutes. Wash the skin off the chili using cold water. Core, seed, dice and set aside. While the chili pepper is cooling, melt the butter in a large microwave-safe mixing bowl at 45 seconds. In the same bowl, add the eggs and quickly beat until blended. Combine with the buttermilk and beat until smooth. Next, in a separate large mixing bowl, add the dry ingredients including the baking soda, cornmeal, flour and salt. Add the diced chili pepper and mix well. Gently fold in the wet batter ingredients until incorporated, (it’s OK to have a few lumps). Remove the hot skillet from the oven and pour the batter into the skillet. BE CAREFUL – it may splatter. I’ll argue the step of pre-heating your cornbread skillet with anyone – it is essential to creating an authentic, crispy crust. Level the batter and bake for about 30-35 minutes, or until lightly browned. A toothpick should pull out clean when inserted into the center of the cornbread. Remove and serve immediately. NOTE: If using Lodge® muffin pans, remove from the oven after 24-25 minutes. Cornbread muffins will cook faster due to less volume. The amount of batter in this recipe will yield 18 muffins. I reverse-engineered this simple dipping sauce recipe from a local Chinese restaurant, with a little help from my waiter. I was shocked how hot it was the first time I tried it. The pungency of the green Thai chili is punctuated by a heady, acrid bite that lingers on your tongue long afterward. Try with spring rolls or as a side to your favorite Asian entree. Wash and trim the stems off of the Thai chilis. Place the chilis and the remaining ingredients in a food processor and puree. Let stand ten minutes and serve. This is an easy-to-prepare classic side dish that my family has made for many years. Cook the bacon until lightly browned and drain off rendered fat. Add the onion and saute until lightly carmelized. Add one tbs. vinegar and stir to incorporate. Place in a heavy saucepan or baking dish and cover. Cook on low for about 1 hour until the green beans are just tender. 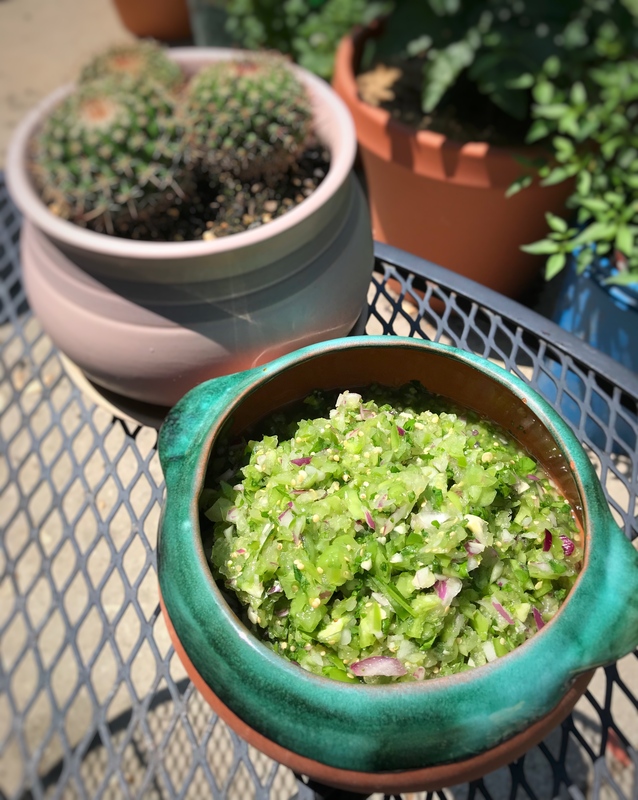 This is another traditional way to prepare green tomatillo salsa. The tomatillos are lightly simmered and then blended. Great over huevos rancheros, chimis or chips. Thanks to Monica and Javier for the recipe! De-husk, wash, core and boil the tomatillos and trimmed jalapeños in water for 1-2 minutes. Allow to cool for about 5 minutes. Put tomatillos, jalapeños, salt, and a little water into blender. Pulse until smooth. Pour into a bowl and allow to cool. 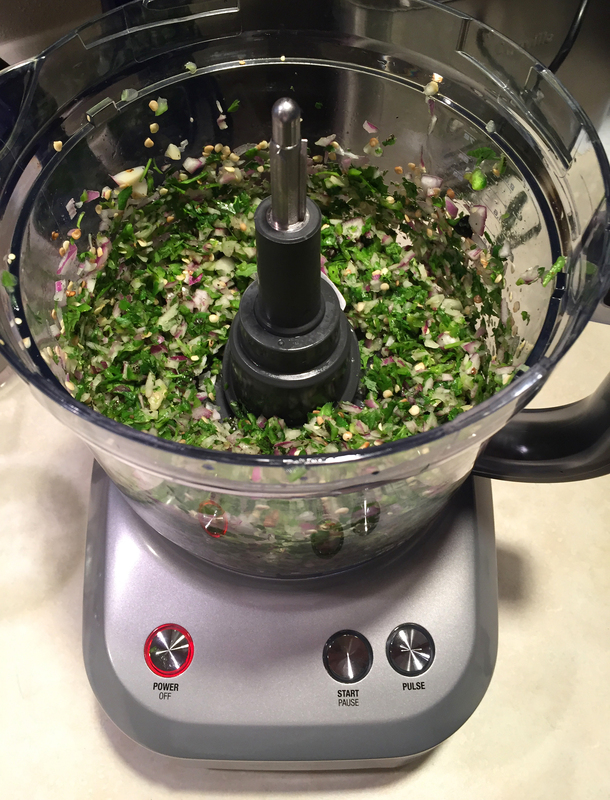 Chop up cilantro and onion and mix into salsa. Taste and correct the seasoning if needed. Tart and crisp – these wonderful fried green tomatoes make the perfect side dish for an end-of-summer dinner. It’s a great Southern recipe for using garden tomatoes that drop before they’re ripe. 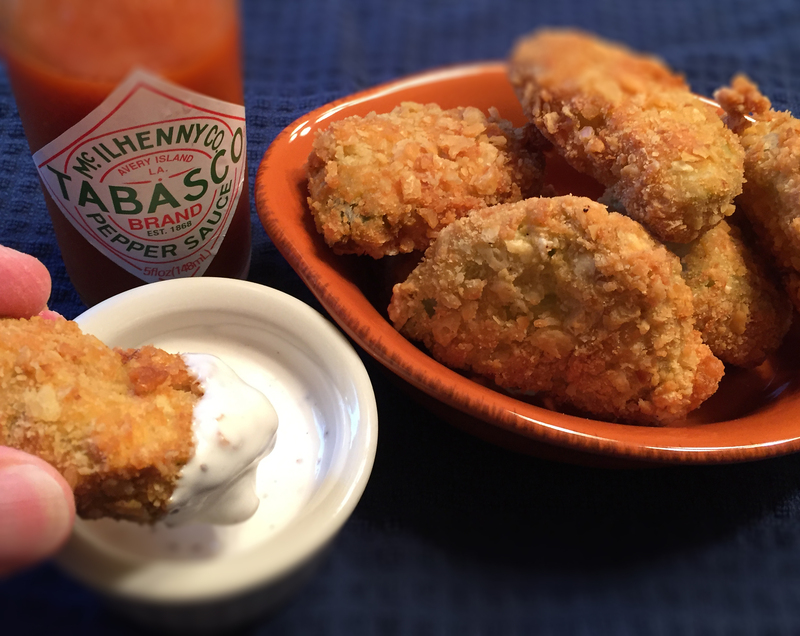 Serve with Ranch or Bleu Cheese dressing and Tabasco® sauce on the side. 3 firm green tomatoes, sliced 1/2″ thick. Wash and core the tomatoes. Slice in 1/2″ thick rings. Set aside on paper towel to draw the excess moisture out. This will ensure that the batter sticks. In a small bowl or plastic shaker bag, combine the flour, salt and pepper. Mix well. Crush the saltine crackers very fine by either using a mortar and pestle, or by placing them in a plastic food storage bag and hitting them with a rolling pin. Beat the eggs and place in a third bowl. Heat a medium-sized cast-iron skillet over moderate heat and place the cooking oil in the pan. Heat to 375-degrees F. When ready, a drop of water should sizzle on contact. Dip the tomato slices in the egg, then the flour mixture, then the egg again, and finally in the cracker crumbs. Fry in the pan until golden brown on each side; about two to three minutes per side. Turn them carefully so the batter doesn’t flake off. Remove and drain on paper towel. Serve hot with your choice of dressing and Tabasco sauce on the side. Note: If the batter fails to evenly stick to the surface, simply re-dredge in egg, and again in the cracker crumbs. This is a great recipe from Emeril Lagasse. I’ve made it several times and it is always refreshing. A nice change of pace. Combine all ingredients in mixing bowl and whisk for 2-3 minutes. You can also mix in a shaker jar for 30 seconds. Place in fridge for one hour before serving. Will keep for several days. This is a wonderful recipe that uses green tomatillos. Tomatillos are Mexican tomatoes that have a papery husk around them. They have a very distinctive lime flavor that is thirst quenching on a hot day. Try this with iced tea and good quality corn chips. 8-10 large, fresh green tomatillos, washed, husked, cored and fine chopped. 2 jalapeño peppers, stemmed and fine chopped with seeds. Place the chopped tomatillos in a bowl and add the chopped peppers and spices. Go easy on the salt, and taste often, keeping in mind that the ingredients will blend together over time – so do not overcompensate. Generally, the mix will become hotter if left to stand a bit. Stir ingredients well and let sit at room temperature for 1/2 hour. If the water content of the tomatoes separates out in the bowl after a while, drain the salsa by placing it in a fine screen basket or colander and then place back into bowl. Use a good-quality food processor when preparing salsa. You’ll save yourself a lot of time and produce more consistent results. Choose one with a large-capacity work bowl, strong motor and a pulse switch. Shown is a premium Breville® Sous Chef 12-cup food processor. The pulse feature allows you to quickly process ingredients with just a few pushes of the button. Note the consistency of the cut. The unit costs a lot more than your average processor, but you get what you pay for.